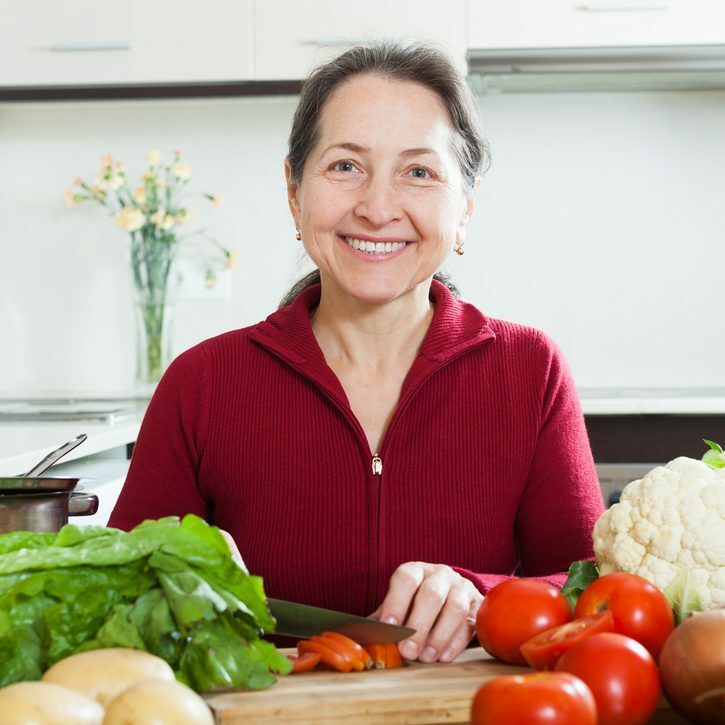 Hamilton Beach is a trusted all-American company that has been making simple and reliable home appliances for many years. If you are looking for a coffee machine that gives you a great-tasting fresh and steaming brew with a minimum of fuss, check out our Hamilton Beach 46205 coffee maker review below. There are perhaps three main selling points when it comes to this machine. The first is that it is extremely simple to use. The control panel is very easy to understand and almost anybody will be able to use this machine. This is a coffee maker that will appeal to people who don’t like things to be unnecessarily complicated. The second major advantage here is the programmable timer. Many coffee makers nowadays include this feature, but it’s one we really love. You can set your coffee maker to start brewing by itself, meaning you can have fresh hot coffee waiting for you when you drag yourself out of bed. Thirdly, this is a very wallet-friendly option. While it’s not the cheapest model available, it is still firmly in the affordable range. Of course, if you want more functionality and perhaps slightly superior-tasting coffee, you can pay a lot more, but if you just want a machine that makes a good cup and that also includes a couple of useful extra features, this is a great option. There are several other features we also liked. The adjustable brew strength that allows you to customize your coffee is a great addition, as is the hotplate with adjustable temperature. Hamilton Beach is a company that is known for making practical, functional appliances, and that side of things is also evident here. The pop-out filter basket and rotating base are excellent examples of this ergonomic design. 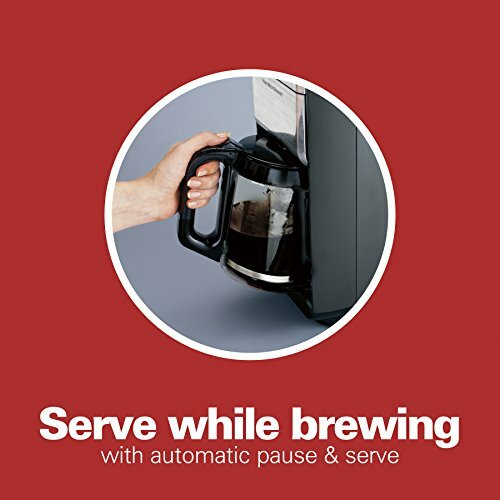 Since ease and speed of use are also big selling points with this machine, the fact that you can pour your coffee before the brewing cycle is complete is another plus – as is the mess-free pouring system. This ensures there are no spills when pouring, even when you stop the unit mid-cycle. There are very few negatives with this machine. However, if we have to pick one, it would be that there is no specific one-cup brewing mode – but see below for details on how to get around this. Otherwise, this is a top coffee machine in this category and price range. This coffee maker has dimensions of 9.26” x 7.41” x 13.78” and weighs 5.29lbs. The machine is made of plastic, and it is supplied with a glass carafe that is large enough to hold up to 12 cups of coffee. Coffee is kept hot on an adjustable hotplate. The reservoir holds 40oz of water, and the reservoir is removable, making it easy to fill. The unit also includes a rotating base, making it easy to access the reservoir, even in smaller kitchen spaces. You can brew coffee at three different strengths, and the machine features a programmable timer that allows you to set the brew cycle to start at a predesignated time – allowing you to have coffee ready and waiting when your alarm sounds. The unit features an auto-off function to help save electricity – this is also programmable for up to two hours. Although this model does not have a dedicated one-cup function, you can still use it to brew only a smaller amount of coffee each time. All you need to do is make sure the water reservoir is not completely full. Simply fill the reservoir with water for the amount of coffee you want to make, put enough ground coffee into the basket for only that amount of coffee and hit “brew”. 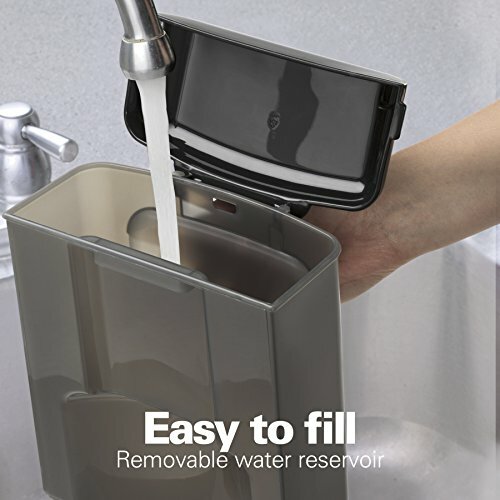 While it might be a little awkward to remove the water reservoir each time you want to make one or two cups of coffee instead of a full carafe, at least the option is there. However, if you think you are likely to only be making one or two cups of coffee more regularly, you should probably look at other coffee makers that specifically have a one-cup setting. This way, you won’t need to remove the reservoir every time you want to make a brew. Cuisinart is a similar company to Hamilton Beach with a similar line of products and a comparable reputation for making solid and reliable appliances. This machine is comparable with the Hamilton Beach model but is slightly larger. 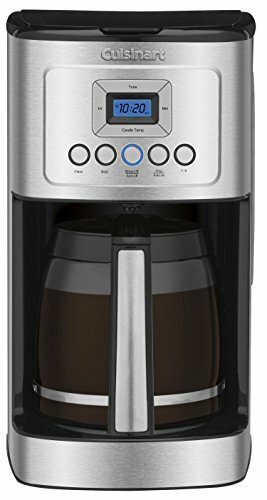 The Cuisinart coffee maker features a glass carafe that can hold up to 14 cups of coffee – compared to the Hamilton Beach machine’s 12. This Cuisinart machine is slightly more expensive, but it also includes technology that ensures it can produce coffee at a hotter temperature without sacrificing flavor. If you like your coffee hot, this could be a good option. One advantage this machine has over the Hamilton Beach model is that it includes the ability to brew smaller volumes of coffee. If you are likely to want to brew 1-4 cups at a time instead of a whole carafe, the Cuisinart is maybe a better pick. We feel the Cuisinart has a slightly more modern, stylish look, but beyond this, and the ability to brew smaller quantities, we feel the two machines perform to more or less the same level. Here, again, we have another trusted all-American company that has many years of producing high-quality, reliable home appliances. 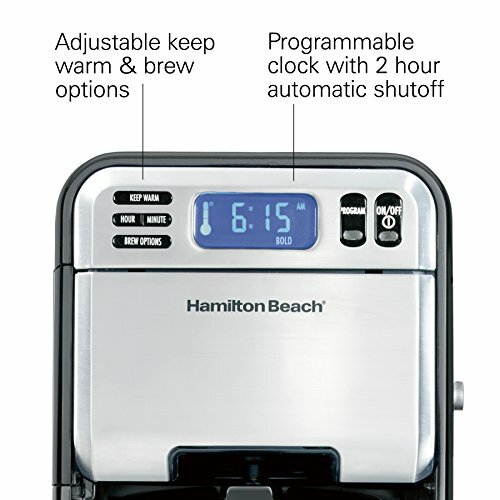 This model is also comparable with the Hamilton Beach coffee maker and has similar capabilities. 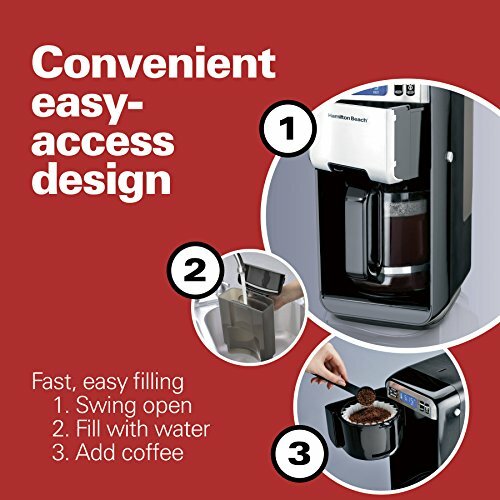 This machine is also supplied with a glass carafe that can hold 12 cups of coffee, and this model also has the same programmable option to allow you to have coffee brewed and waiting when it’s time to leave your bed in the morning. This brewer features special steeping technology to ensure a more uniform extraction and a superior tasting brew. However, this machine doesn’t include the rotating base that makes filling the reservoir of the Hamilton Beach so effortless each time. 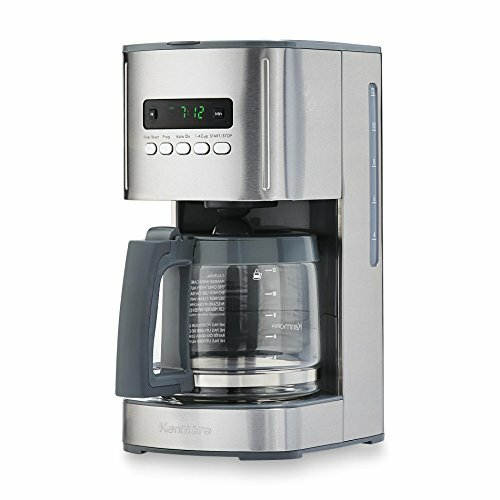 Similar to Hamilton Beach, this machine also allows you to choose the brew strength, with three options of mild, regular and strong. 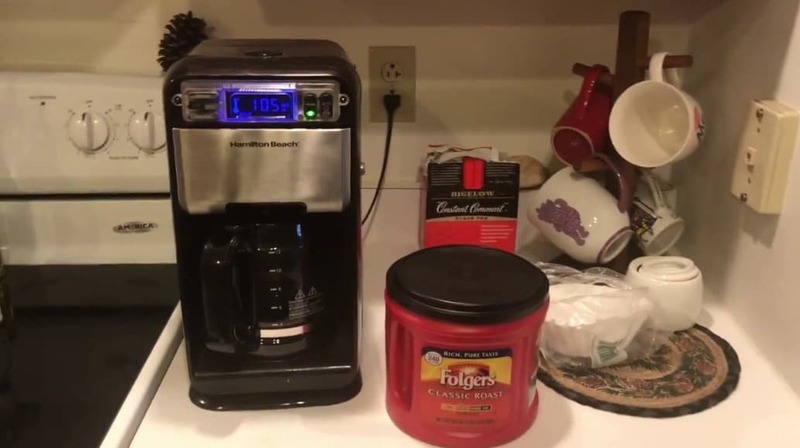 The price of this machine is more or less the same as the Hamilton Beach coffee maker, and this would be another good pick if you decide not to go with the Hamilton Beach unit. 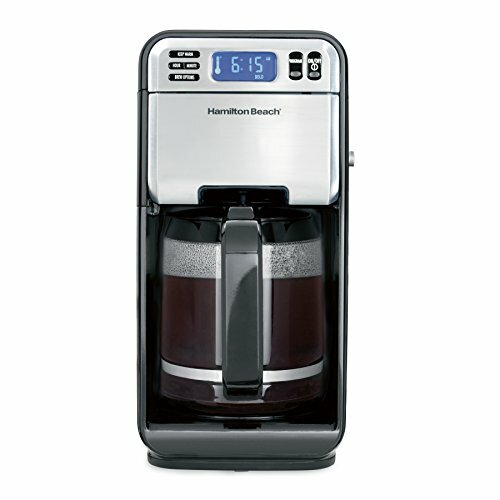 As you can see from our Hamilton Beach 46205 coffee maker review, this brewer is exactly what it is designed to be – a solid and reliable brewer that does a simple job well: it makes great-tasting coffee with a minimum of fuss. If that’s what you’re looking for in your coffee machine, then this brewer could definitely be worth considering.